Many people feel that an adequate supply of clean water will be one of the most significant issues of the future, and I have no reason to doubt that. The United States has been blessed with an abundance of good water, and we have gotten used to having it at the twist of a faucet handle. It can be a shock when water supplies diminish and water has to be rationed, or if the supply gets contaminated and is no longer available for potable use. Water agencies always advise conservation; they know how precious and limited the supply is. In fact, many plumbing codes now require that new installations of toilets be low consumption models and that showers be fitted with restriction diaphragms to limit the flow of water. Other strategies for conserving domestic water tend to be rather controversial. The reuse of gray water, using rain water catchment systems and composting toilets all conserve water but may be frowned upon for various reasons, mostly to do with health concerns. In many places these practices are flat out illegal, even though they have been shown to be safe and effective when utilized carefully. Recycling gray water (from the drains of baths, showers, washing machines and bathroom sinks) is very tempting because it seems so benign and obviously of value. Black water waste (from toilets, kitchen sinks, garbage disposals and dishwashers) is more clearly of dubious value because of all the organic material it contains and the potential for bacterial contamination. About 2/3 of all the water used inside a typical house could be diverted for the use of watering plants, flushing the toilet or washing clothes. Here are some guidelines for gray water use: never use for direct consumption; don't use directly on anything that might be eaten; don't spray it; never reuse water from washing diapers or cleaning meat or poultry; occasionally water plants with fresh water as well to leach away any buildup of toxins, and use biodegradable soap. Because of continuing draught, California legalized the use of gray water in 1992. However, it was only legalized for subsurface use, either with drip systems or mini-leach systems. 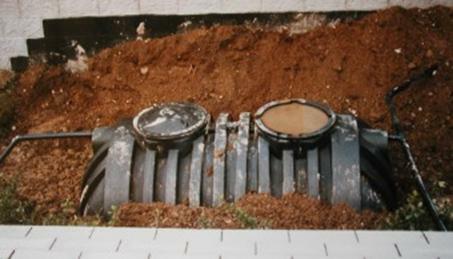 Drip systems require the use of a surge tank to clarify the water, where leach systems may use the gray water directly. In either case the water must be introduced at least eight inches below the surface. Rain water catchment is definitely gaining popularity throughout the U. S. , with an estimated 250,000 cisterns in use. There are many places where it is the only way to get decent water. Again, these systems are not without some health risks, so care is advised in setting them up. Rain water can be used directly without treatment for evaporative coolers, toilets, car washing, chlorinated swimming pools, and surface irrigation. For other household uses, it is advised that the rain water be disinfected. Roofs made of metal, clay, tile, or slate are often used to catch the rain; other types of roofs might leach harmful components into the water. A clever way to capture the initial rainwater that might contain bird droppings, dust and debris, is to employ a standpipe where the first water fills the pipe, and then the overflow goes into a cistern. This standpipe is then drained after the rained has stopped. It is recommended that about ten gallons be diverted for every 1,000 square feet of roof area. The cistern or storage tank should be situated as close to the downspout and at as high a level as practical. Of course during seasons subject to freezing weather, the system must be protected from frost damage. Also a sealed tank will keep the water cleaner. Sometimes water is captured from paved areas, and that is best used for watering plants. A considerable amount of water is typically used for watering landscaping, especially lawns. It takes about 660 gallons of water to put one inch of water on 1,000 square feet of lawn. When Rosana and I were living in a bus conversion motor home, we managed to accommodate all of our domestic water needs (including showering) on about 20 gallons a day, so that bit of lawn watering would have provided us with about a month's worth of water! If you must have a lawn, just water when it really needs it, or better yet, let it go brown during the dry season. Other strategies for diminishing outside water use include mulching plants, using drip irrigation or soaker hoses and planting indigenous, drought-resistant plants. In my place (Manila Philippines), supply of clean water is already becoming a problem especially during the summer. Sadly, the government has little plan on how to solve the problem. They should read this blog post.